The Girona Gran Fondo is a fantastic chance to ride the roads that the professionals also do for training. 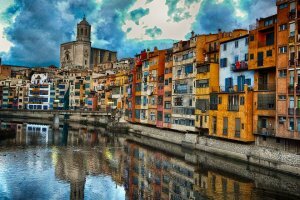 Wander through Girona and discover the tourist attractions, festivals, restaurants and cultural events. So jump on your road bike and cycle the Gran Fondo Girona in Spain. Guided cycling Trip Gran Fondo Girona 2019. From June 14 -17. 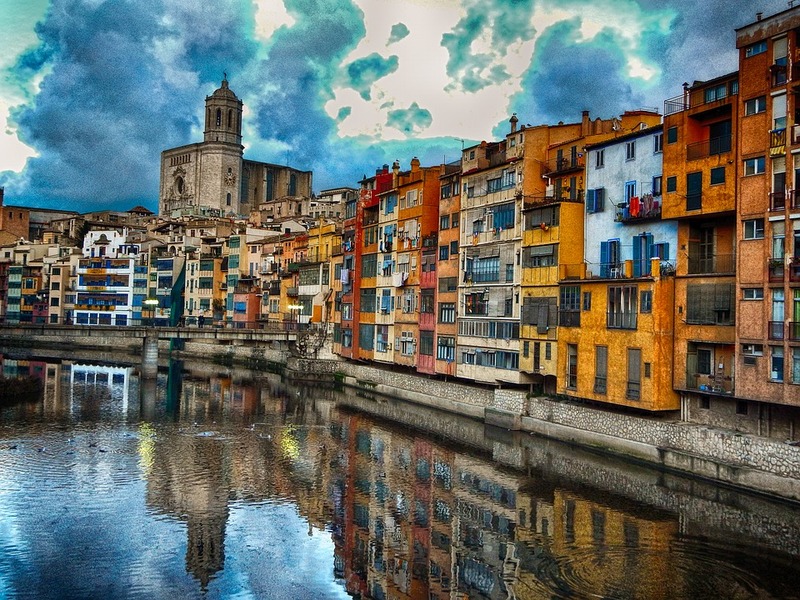 About 70 kilometres north of Barcelona, you find Girona. 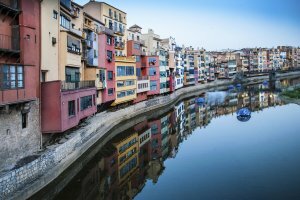 This small Catalan town is famous for its road cycling friendly surroundings; it’s not a coincidence a lot of professional road cyclists from all over the world choose Girona as their home base. The most famous inhabitant of Girona used to be Lance Armstrong, but also road cyclists like Tyler Hamilton and David Millar lived in the city for large parts of their careers. At the moment, Girona is for example home for Steven Kruijswijk, Robert Gesink and Daniel Martin. Big chance you’ll bump into one of them when you wander the cosy little streets of the old town. 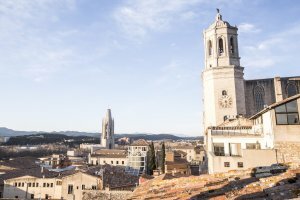 This lively city will always hold something in store to delight you Immerse the old city of Girona in the evening with its large cobblestone streets and steep stairs. Catalunya, Spain, has long been known for the quality of its riding, its labyrinth of twisty medieval streets with hidden restaurants. And now comes the chance to enjoy a Gran Fondo in the greatest cycling city in the world. The regular route of 125km is the GF loop. The die hards go for the full track of 142km including the new Rocacorba climb! So jump on your road bike and cycle the Gran Fondo Girona in Spain. Check in around 14.00 at your hotel in Girona. At the office you can get your bike and there is time to ask for all kind of info in and around Girona. Today there will be an organized morning trainings ride. In front of the bicycle shop in Girona starts a warm up ride. 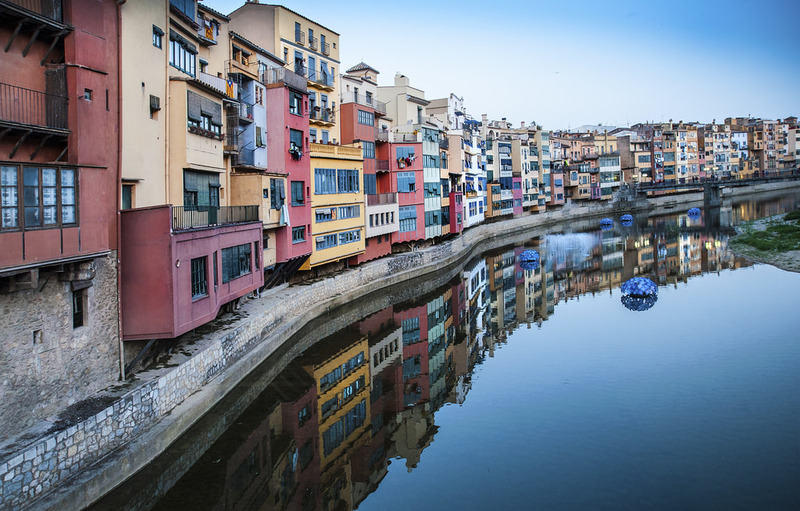 About 70 kilometres north of Barcelona, you find Girona. This small Catalan town is famous for its road cycling friendly surroundings; it’s not a coincidence a lot of professional road cyclists from all over the world choose Girona as their home base. 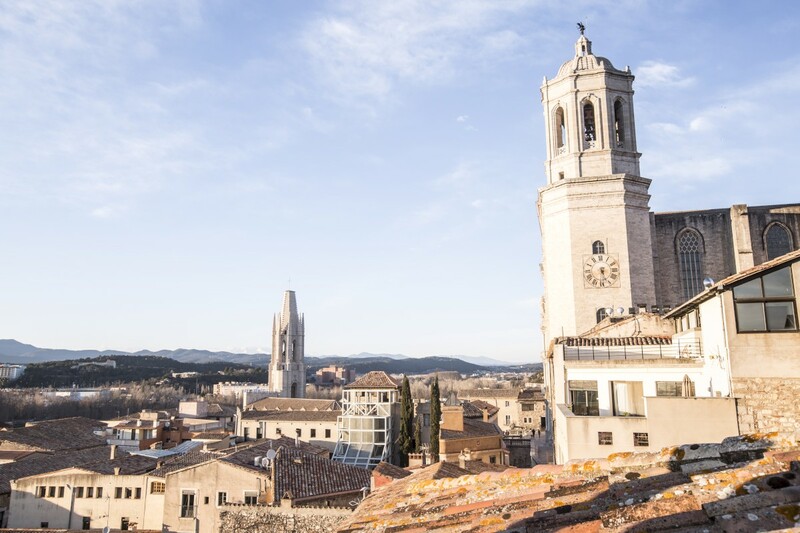 The most famous inhabitant of Girona used to be Lance Armstrong, but also road cyclists like Tyler Hamilton and David Millar lived in the city for large parts of their careers. 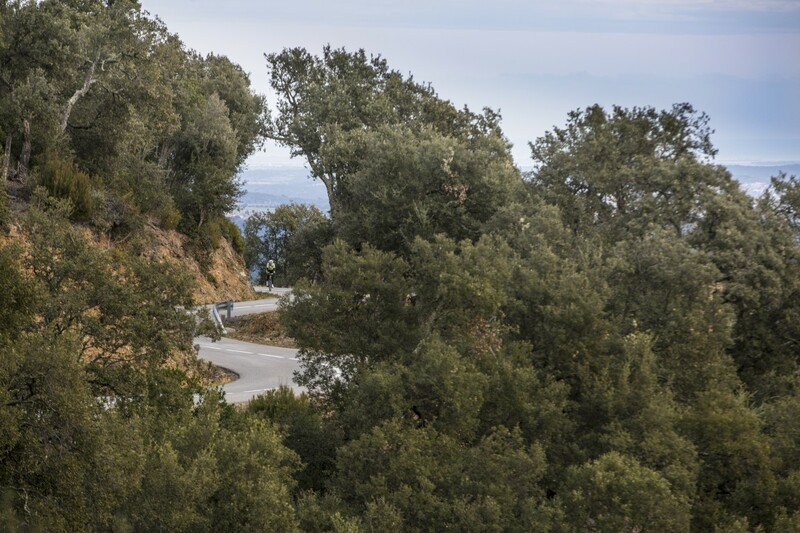 At the moment, Girona is for example home for Steven Kruijswijk, Robert Gesink and Daniel Martin. Big chance you’ll bump into one of them when you wander the cosy little streets of the old town. The Girona Gran Fondo is a 125 km circuit through some of the most picturesque parts of Catalunya. Accessible for all levels of road cyclists, the Gran Fondo takes riders along stunning roads to the historic village of Santa Pau and beyond. All riders are sure to enjoy this self-set paced ride! After the success of the last events, the organisation unchanged the route with a breath taking ride through Girona. The die hards go for the full track of 142km including the new Rocacorba climb! Departure day…..Time to say goodbye, a good flight back home or a pleasant stay in Spain. The most important gateway to/from Barcelona is the international airport 'L' Aeroport del Prat'. With over more than 25 million passengers per year, Barcelona airport has the second biggest airport in Spain after Madrid. There are many regular flights to/from Europe. The second airport in Catalonia is Girona airport. Girona airport “Costa Brava “is a very important hub to the Pyrenees and the nearby tourist destinations like Malgrat de Mar, Blanes, Lloret de Mar and Rosas. Girona airport is situated approximately 100 km away from Barcelona. The airport doesn’t have a railway station. First you take the bus to Girona and from here trains running every half hour to Barcelona. From Barcelona airport. Every half hour trains leave to the main stations in Barcelona. Take the Renfe train line that leads you to Plaza Catalunya, Arco de Triomf or Clot-Arago. Mostly the stations have connections to other metro stations. Every 15 minutes the Aerobus A1 leaves from Barcelona aiport (terminal A & B) to the center of Barcelona. In terminal B you will find other bus lines leaving to many cities nearby Barcelona. From 23.00 to 04.15 you can take the night bus 106 to Barcelona. The best option from Girona airport is the bus. The bus ride takes you in one and a half hour to downtown Barcelona. In front of the arrival hall you can find the bus stop. There are three options, you can leave to: Girona, Costa Brava resorts or Barcelona.